Rehmatud Din (c) who lost his daughter in Monday's earthquake, salvages what he can from his destroyed house caused by Monday's earthquake in Chitral town, northern Pakistan, October 29, 2015. Rehmatud Din walked 10 hours and scrambled through landslide debris to reach his family in this remote northwestern town that was devastated by a 7.5 magnitude earthquake this week. When he finally arrived, he learned that his 6-year-old daughter had died after being crushed by the roof of their home, and that she had already been buried by relatives. "I did my best to reach Chitral but boulders and landslides had blocked all the roads," Din said Thursday, tears welling in his eyes. "I lost her at such a young age." The death toll from Monday's quake — centered in Afghanistan's sparsely populated Badakhshan province that borders Pakistan, Tajikistan and China — stood at 390. According to officials, at least 272 people were killed in Pakistan, 121 in Afghanistan and three on the Indian side of the disputed Kashmir region. A report released by the National Disaster Management Authority says 32 people were killed in Chitral, the Pakistani town closest to the quake's epicenter. 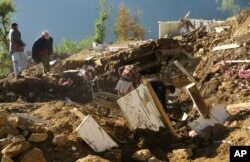 At least 50 people were killed in the nearby Shangla, the country's worst affected area. Din, a 45-year-old construction worker, was on a job in the nearby town of Gilgit when the earthquake struck. He said his wife gathered their six other children in an open area outside their home, but 6-year-old Zar Shi was caught in the roof collapse. She died at the local hospital after neighbors pulled her out from the rubble. Aysha Saddiqa, 12, was overcome with grief and unable to answer a reporter's questions about her sister. With tears rolling down her face, she simply looked at the rubble covering places where they used to play together. 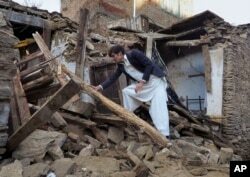 Residents in Chitral were trying to salvage their possessions on Thursday. They called for government help to repair their homes, saying they are too poor to do it themselves. Housing is urgently needed, with snow already falling on nearby mountains. Pakistan's disaster management authority said it has distributed 28,219 tents, 35,700 blankets and tons of food among quake victims. Afghan officials were also distributing emergency supplies like tents, food and medicine. The worst quake-hit areas are in remote mountainous regions that are hard to reach at the best of times. Taliban are active in some parts, further complicating access. The spokesman for the Taliban, Zabihullah Mujahid, said the militants were not conducting military operations in earthquake-affected regions of Afghanistan but denied calling a ceasefire. On Tuesday, the group called on all Afghans and charities to "not hold back in providing shelter, food and medical supplies to victims of this earthquake." The Taliban have been spreading their footprint across previously-peaceful northern Afghanistan this year, using what officials have said is a new strategy to take strategically-insignificant districts in regions like Badakhshan to force government forces to spread their already limited resources ever-thinner.